To those tasked with procuring power and gas for the first time, the industry can seem overwhelming with densely technical and sometimes conflicting information. Based on our commitment to education Kobiona created a program – SmartProcure. The program is 60 minutes in length and provides new buyers with a thorough market history and background, explanation of cost components within the units of measure (kWh and therm), overview of all possible procurement methods, and contractual options available to address specific business needs and risks. Over the past few years in New England, the “cost deck” – the individual components that comprise a kWh in New England have shifted greatly. 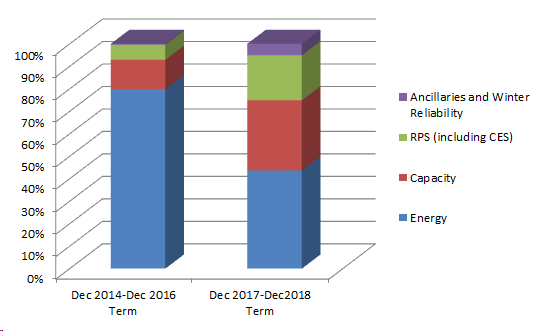 Now, quite often non-energy components, namely capacity and RPS (Renewable Energy Standards) cost more than energy itself, which has remained within 15% of historic, 20-year lows for the past 24 months. Managing non-energy costs has become just as – if not more – important as managing the timing of energy purchasing itself. Capacity alone in parts of New England accounted for as much as 35% of all-in costs per kWh the past year due to a onslaught of premature power plant retirements back in 2014. The graphic below compares relative costs by price component within each kWh for a sample customer load for a Dec 2014-Dec 2016 term versus a Dec 2017-Dec 2018 term. This customer’s facility resides in the NEMA load zone (northeastern Massachusetts, which includes Boston) where energy buyers confront the highest electricity costs in the continental U.S.
Kobiona works with each of our customers to understand what each individual price component – most importantly their current capacity obligation – will cost relative to their past history to help them decide when- and for how long- to lock in both non-energy and energy components for their future requirements.